Bundesliga | RB Leipzig's Ralph Hasenhüttl: "We can win with kids!" 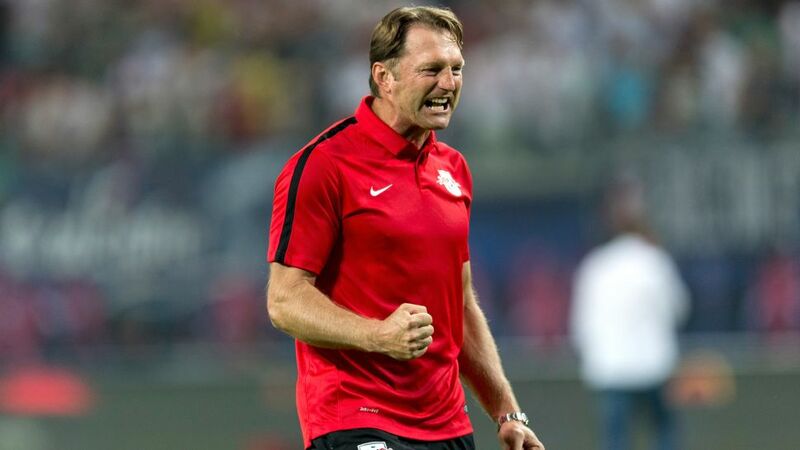 RB Leipzig's Ralph Hasenhüttl: "We can win with kids!" Fresh from securing second place in RB Leipzig's debut Bundesliga campaign, bundesliga.com caught up with the tactician behind the most successful Bundesliga debutants in the league's history. With a place in the Champions League group stage secured for 2017/18, Ralph Hasenhüttl is already looking towards the new season and what his young troop can do at Europe's top table. bundesliga.com: How would you describe your team’s football in one or two sentences? Ralph Hasenhüttl: The focus of our play is our work off the ball. When we have the ball ourselves, then our quality within the team makes it hard for teams to defend against us. I think that description is pretty to the point. bundesliga.com: A description that isn’t exactly similar to the football you played at your previous clubs, such as Aalen or Ingolstadt. You’re not really a one-trick pony with tactics then, are you? Hasenhüttl: Spot on. I’ve coached four teams to date and have always used a different style of play. I believe it’s always about adapting your style of play to the quality of player you have at your disposal. What are they capable of, what fits best to their mentality, what do they agree on, what is their drive and how to they perform best? Those are the questions I have to answer for myself as a coach. Hasenhüttl: Yes, because this style of play is what the public identifies best with. It’s about creating an experience for the fans. I think it’s always something special to see a team that’s fully invested in their work and physically determined. Then the fans get the feeling that the boys are giving their all. Without question, that is a distinctive feature of all of my teams so far. Hasenhüttl: I never had such worries. The games we lost were mostly down to bad luck. The opponent maybe had one shot on goal and scored, whilst we created plenty of chances without finding the back of the net. But that can happen in football. Some people in winter were already prophesising a complete collapse in the new year, that teams had cracked us and would learn to adapt to our style of play. And when the euphoria of the first few months had subsided, then we’d become just an average, mid-table team. But I always knew we had great quality and that wouldn’t be the case. The Rückrunde has proven me right. We are already playing like a top team and are rightfully where we are in the table. bundesliga.com: Next season you will have a new challenge with the burden of three competitions. Even at European level, failure cannot be ruled out. How will your young team approach this challenge? Hasenhüttl: I hope they can manage it. We will do our best to spread this extra burden across several sets of shoulders. We want to get through this burden with a large squad, but of course it will be an extra challenge and an experience for us. bundesliga.com: The faces in this team will not change too much. Does the squad have to get older with the addition of some experienced members? Hasenhüttl: No, that is definitely not the case. We are against any claims that it’s impossible to survive in the Bundesliga with a squad of under-23 players. Our squad is already experienced. We have proven this to be false, and have no intentions of bringing in older players for next season or making knee-jerk reactions after defeats. That would be a sign of weakness and the lack of a plan. Sometimes those actions can do more harm than good, which is why I am against any form of knee-jerk reactions. bundesliga.com: You were promoted to Bundesliga 2 with VfR Aalen and to the Bundesliga with Ingolstadt. You were able to keep Ingolstadt in the division, and have now qualified for the Champions League with Leipzig. Who or what is stopping you from soon believing you can even walk on water? Hasenhüttl: (laughs) I don’t need anyone to stop me from doing that. I’m well aware how fantastic the last few years have been for me, but I’m also humble enough to believe that it won’t always carry on like this. I also know too well that I couldn’t have done all this without all my colleagues around me. I certainly don’t believe I’m more important than I am, but I always remember that quote by Michael Schumacher: “The flowers of victory belong in many vases.” I am just one of them. That’s why I have never yet taken workers from former clubs with me to my new jobs, but always tried to blend into my new surroundings. That way I never run the danger of becoming too important myself. Vote for your Bundesliga Team of the Season below! Click here for more Leipzig news.